As the range of flooring types available is so diverse, and your choice has such a huge influence on the look and feel of your home, you should know your options and your preferences before making a decision. You will need to consider what you want and expect from your floor before purchasing. This will depend on a number of factors like the room in question and what you tend to do in it. Knowing your options and prioritising elements such as style, maintenance, price, durability, and comfort, to your own preference, will help you reach a decision. The original wooden floor; one solid 3/4in thick piece of hardwood is milled to create a solid wood floor board. This is the most expensive and luxurious type of wooden flooring and will increase the value of your property. It will however expand and contract with changes in room temperature, but a good floor installer will allow for this by leaving room between the floor and the walls. This option is least suitable for moist rooms, e.g. bathrooms and kitchens, and it is also least suitable for a do-it-yourself installation. Engineered hardwood floors have the same appearance and texture of solid wood floors but consist of three to five layers of hardwood stacked and bonded using heat and pressure. It is a slightly less expensive alternative to a solid wood floor, and will expand and contract less. Engineered hardwood is also more suitable for kitchens and bathrooms than solid wood, but should be installed with a suitable moisture-resistant underlay. A semi-solid wood floor consists of a solid hardwood top layer bonded to a strong plywood (or similar) base. Like engineered floors, it gives the look and feel of a solid wood floor for a lower price. The structure of semi-solid makes it highly resistant to fluctuating temperatures and moisture levels, and therefore more versatile in suitability to different rooms throughout a home. The quality of a semi-solid floor depends on the thickness of the top layer, which can be sanded if thick enough to prolong its appearance. Laminate flooring is a cheap and easy to clean option that gives the look of a wooden floor but not necessarily the texture. Also known as a floating floor, it consists of multiple synthetic layers topped with a photographic layer and a transparent protective layer. The choice in finishes and colours is vast. Laminate is durable and hardwearing but cannot be sanded or refinished. It is the easiest floor to install, often using a “click-fit” system where the planks click together and are then ready to walk on. The ideal choice when longevity is prioritised over comfort, a tile floor can be cold but is very hardwearing and practical. 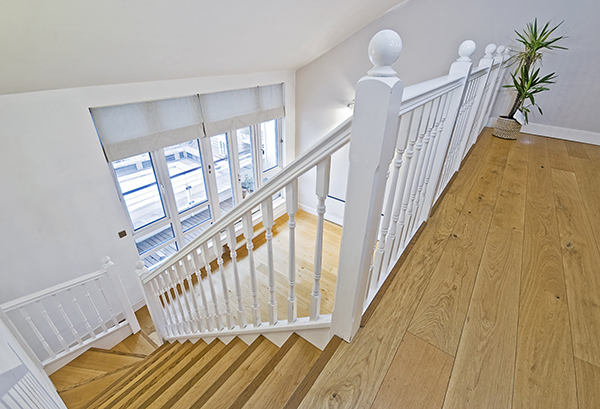 Most commonly chosen for high moisture areas where wooden floors wouldn’t last so well, i.e. kitchens and bathrooms, they are also often used for high traffic areas such as entranceways and halls. As well as endless choice in sizes, colours, shapes and textures; there are a variety of materials to choose from, including: ceramic, porcelain, stone, concrete, marble, granite, and more. Ceramic and porcelain are less porous and therefore more hygienic and easier to clean. They are also cheaper than alternative tiles, yet more likely to crack if you drop something heavy on them. Slate, stone, concrete and brick can feel rough and are difficult to clean but they are most resistant to cracks and stains. Marble looks beautiful, is easy to clean and stain resistant; but it is expensive, prone to scratching, and slippery when wet. Granite, Travertine and Saltillo tiles all require regular maintenance to preserve their attractive appearances. Vinyl and lino are low price flooring options that don’t require any maintenance and are easily cleaned. They are however vulnerable to stains and tears with wear, difficult to install properly, and they don’t enjoy the same prestige as wooden or tiled floors. They are made with a combination of synthetic and natural materials, formed into solid sheets with heat and pressure. They are available in decorative patterns and also designs which impersonate a wooden or tiled floor. The most warm and comfortable flooring option, but also the most difficult to keep clean; carpets vary wildly in quality and price making them also the most difficult floor to choose. You will get what you pay for with carpet. Cheaper options tend to feel less comfortable underfoot and also wear much quicker, staining and losing their cushioning after just a short period of use. Carpet with a rubber or foam underlay provides excellent sound absorption, ideal for use on stairs. When choosing a carpet, you should shop around, ask the sales attendant’s advice, and bring home some swatches to see how the colours work in the actual environment and lighting of the room.